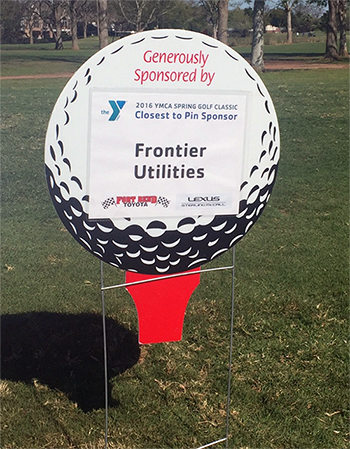 Frontier proudly sponsored 2016 YMCA Golf Classic, Benefiting Fort Bend County YMCAs. Each year, the YMCA Spring Golf Classic raises funds to ensure the YMCA continues to strengthen the community through outreach programs focused on preventing chronic disease, eliminating drownings and improving the academic performance of the youth. With a heart to give back to the local community, Frontier is showing its support by sponsoring the 2016 YMCA Golf Classic which was held on Monday, March 21 at the Pecan Grove Plantation Country Club. Frontier sponsored the 4th hole beverage station and 7th hole “Closest to the Pin” competition, giving prizes to the Male, Female and Senior winners.